Class 1 teacher is Mirs Sim and Mrs Austin is our Teaching assistant. 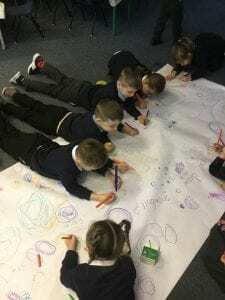 We are a mixed Reception and Year 1 class at Sunnybrow Primary school. Our class Teachers are Mrs Sim (Mon-Thur), Mr Irons (Fri) and we have Mrs Austin, who is our full-time Teaching Assistant. We have lots of fun as well as working incredibly hard! 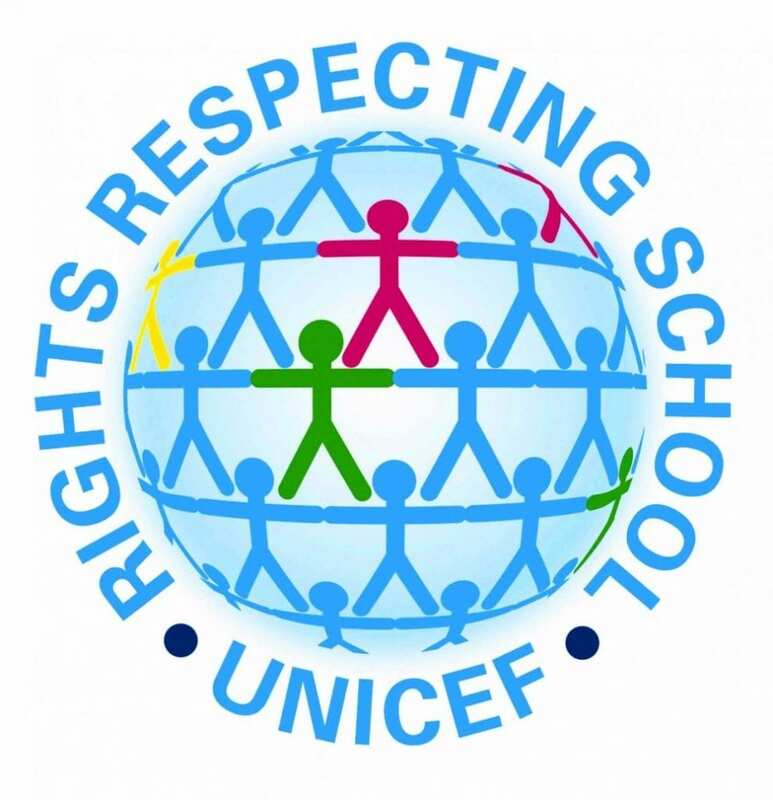 We follow topics throughout the year, but we also follow the children’s interests and plan unique learning experiences based on these. This term, we are preparing ourselves for reading and writing. Our topic is ‘Nursery Rhymes’ and we are developing our awareness of rhythm and rhyme, learning to speak in full sentences and taking turns in conversations with our friends. 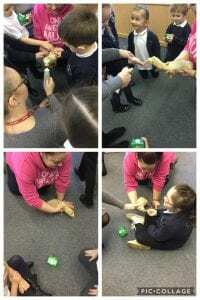 Every morning, we do Dough Disco or an early pre-writing skills programme to strengthen our fingers and help us form the basic pre-writing shapes. We also do phonics for half an hour after lunch. 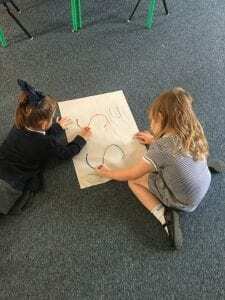 Reception children are completing pre-reading activities such as learning to orally blend and segment sounds and Year 1 are revising Phase 2 and 3 sounds. For Reception children, this is preparing us for learning our Phase 2 letter sounds after the half-term holiday. For Year 1 children, it is consolidating our previous learning in preparation for completing the Year 1 phonics test in the Summer term. In Maths, we are following the ‘White Rose’ planning scheme and are planning small steps in learning to ensure that we ‘close the gap’ in children’s understanding. This term, we are focusing on place value, counting and shapes. The focus for this half term and next will be learning our sounds and letters (phonics). We will also be looking at some everyday words (high frequency words), e.g. I, go, no. We will begin looking at the book Brave Little Bear and then moving onto other bear stories. We will be getting familiar with the book and carry out different activities based around the book. The focus this term will be on counting and finding out about numbers. The children will use a variety of activities to sort, match and group objects. The children will also be learning about shapes and begin to describe shapes. During this half term the children will be learning about themselves, this includes how they have changed, what makes them healthy and their surroundings. If you have any baby or toddler photographs available to send to school that we could photo copy to use for our work please send them in. CLASS 1 NEED YOUR HELP!! We are so keen to make models in our junk modelling area, but we are going through junk materials so quickly that Mrs Sim, Mrs Austin and Mr Irons cannot keep up! Please could you keep your boxes, yogurt pots, kitchen roll tubes, bottles and bottle lids and bring them in as often as you can? We were very lucky today to be visited by Sheila the ferret! The class loved feeding her vitamin paste and stroking her. Today, we have had money afternoon in school. In Class 1, we read a story about a girl called Tara who learnt how to save her pennies so she could buy treats for herself. 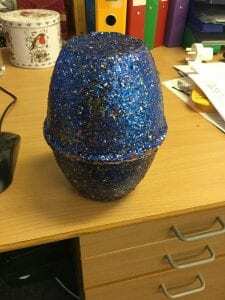 We have all made a money box and put a penny inside to start off our saving. We’ve warned the children not to put the pennies in their mouths! 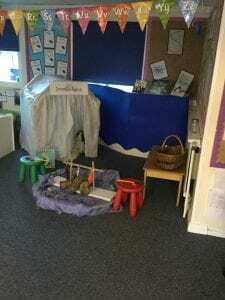 This morning we came in to find an Igloo in our classroom! It belongs to a girl called Immi! We are all so excited!! Bertie the penguin must have known that we are practising our shapes this morning, as he challenged us do draw lots of circular snow balls. 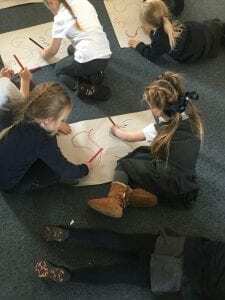 We then progressed to drawing snowmen and letter shapes o, a, g too! 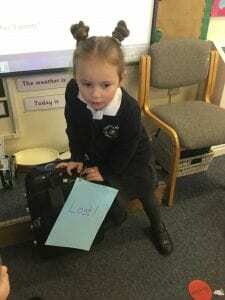 After playtime, we came into our classroom to find a suitcase on the carpet and a Lost sign! Inside the suitcase was a baby penguin and a note explaining that Bertie the penguin has been on his holidays but he has lost his way and cannot remember where he lives. 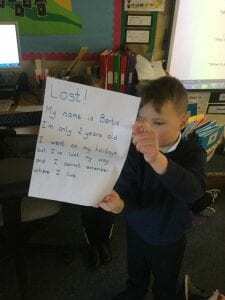 We have decided to help him find his way home! Stay tuned as we learn all about cold places and Emperor Penguins. HAPPY NEW YEAR! Wow, I cannot believe we are in 2019-last year seemed to fly by! I hope you have all had a fantastic Christmas and managed to have some time to relax! 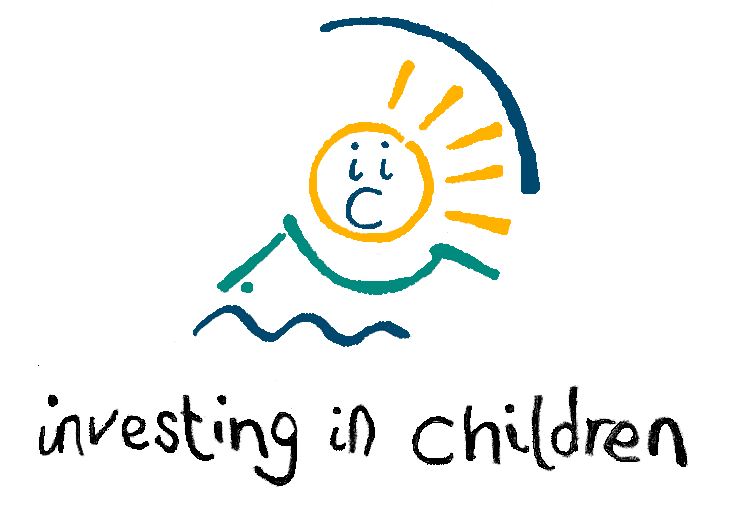 We are all really excited to see the children again this week and hear all abut their Christmas break. 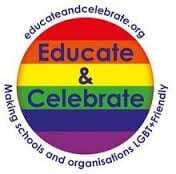 We’d love to see some pictures of your celebrations-Reception children can share their photographs on Tapestry and Year 1 children send them as a message on here. For now, I will be working Tuesday-Friday, so Mr Irons will be greeting the children back to school tomorrow and I will see you all on Tuesday. This is a really busy term, but we are kick-starting it with a fantastic topic called ‘Frozen’ (Not the movie!) where we will be learning all about life in cold places. As always, thanks for your continuing support! Here’s to a super Spring term! 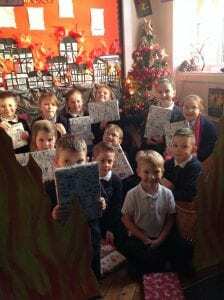 Class 2 walked into an amazing surprise when they followed Santa’s footprints into our classroom. There were enough presents under the Christmas tree for everyone!! We have had so much fun for Christmas Day at School! We’ve done our dress rehearsal for our play, watched a movie, had hot chocolate and a cake and dressed in Christmas outfits! Wow, what a busy week we have had! As we approach our Christmas break and our Nativity, we are finding it really hard to fit everything in. We’ve tried really hard to keep on top of changing reading books, but if we have accidentally missed your child out, please do let us know and we can change the book after school. We haven’t learnt any new sounds this week, but have concentrated on revising our previous sounds, so new sounds will be stuck back in books again after the holidays and Year 1 spelling tests will also recommence after the holidays. I will be working Monday-Thursday next week, so if you do have any concerns or questions, please do feel free to catch me then. As per the yearly planner, our class party is on Tuesday afternoon. Please could your child bring a small savoury item for our party food and your child can bring party clothes in a named bag. Today was democracy day so Class 1 had a go at voting for what they wanted, but only they boys were allowed to vote! We also also learnt that this is not fair, but is how things used to be in the UK. In the end we had a fair vote where everyone had a say. Tomorrow, Class 1 are off on a walk around Sunnybrow. We are looking at features of our village for our Geography study of our local area. Please give us a wave if you see us! As you may have noticed, some of our children are really enjoying our new approach to playtime (playing on the field) and are getting rather mucky! Please could you send in a change of clothes with your child in a named bag, just in case this happens. If your child has come home in any P.E. kit, please could you return them asap as we are getting short of kit. From Friday, Year 1 child will be bringing home 6 spellings to learn for a test the following Friday. 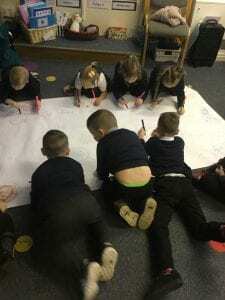 What an exciting week we have in Class 1! 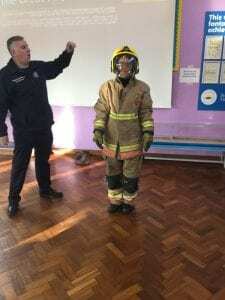 On Monday, we were visited by Crook Fire Brigade. They taught us all about Fire Safety and we even got a turn at using the fire hose! Then, on Tuesday, we went onto the school field and found a dragon egg nestled in a tree!! We have spent the week talking about what the dragons might look like and have produced some fabulous work on adjectives in Year 1! You child will be brining home Phase 1 flash cards. We will be learning these sounds this half-term. Please practise them at last 3 times a week with your child as well as reading books. You child also brought home a sound book. Please could these be returned to school each week so new sounds can be added and can you please try and practise the letters with your child too. Parent’s evening is on Wednesday 7th November. I am available for appointments from 3.30pm-5.30pm. Each slot is 10 minutes long. Please either message me on here or catch me at home time and suggest a time and I will book you in. If this doesn’t suit, please let me know. I hope you are all having a great half-term! I have spent a lot of time this week analysing our on-entry data for our new children and looking at our strengths and areas of learning we need to develop. I want to make our classroom really inspiring and make sure that it is well-resourced and meets the needs of our children. I have identified a number of classroom areas that I would like to develop and have started to collect some resources, but I could really use your help! I want to create a cosy classroom with a homely feel and want to use as many real-life resources as possible. Please, if you are are having a clear-out or know anyone who is, please keep us in mind. I know some of these might be a long shot but if you do have anything you think might be suitable, that would be great! 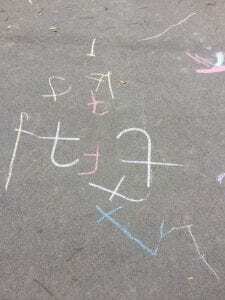 We learnt the sound for t today and went out on the yard to write it. We were superb! Today, we decided that Reception are doing so well that it is time to learn our letter sounds. 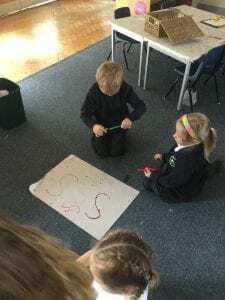 We learnt the sounds for ‘s’ and had a go at writing the letter. Soon, we will be bringing home sound books, but in the meantime please practise writing the letter s whenever you can! Good morning everyone. We hope you are having a great weekend! Don’t forget, if your child is in Reception, you can upload photographs and videos to their learning journal on Tapestry. They don’t have to just be examples of your child reading, writing or doing maths. It could be an example of your child learning about the world around them, using a technological device, playing with friends or siblings, riding their bike, climbing a tree, eating something new for them, tying their laces, singing and dancing…We can then share the photographs in class too. 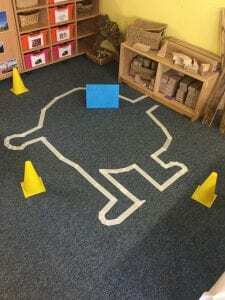 Class 1 have a mystery to solve this week! Humpty Dumpty has fallen off the wall and even the King’s men cannot save him!! We are going to find a super hero who can! What a quick week that’s been! Time flies when you’re having fun! This week, we learnt the Nursery Rhyme ‘5 currant buns in the Baker’s shop’ and we even had our own class shop! Class 1 are really shining in school-they are quickly picking up our school rules. There is so much learning taking place and Tapestry accounts are now filling up with observations. Please do share you own pictures from home too-Thanks to everyone who already has done this! Have a great weekend and see you next week…where Class 1 are going to have a mystery to solve!! 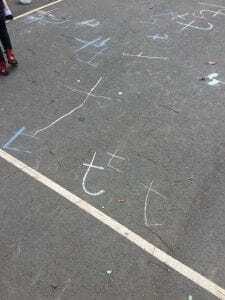 After half-term, we will be learning our letter sounds and how to write them. Before then, we are doing lots of pre-writing and reading activities. 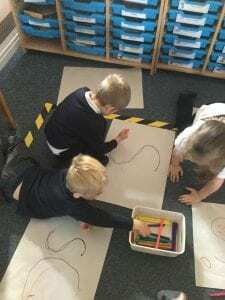 We have been doing Dough Disco and Squiggle while you Wiggle to learn our early writing shapes and strengthen out fingers! It is so much fun!